Inventory and Home Sales: What's the Relationship? | Orange County, CA Real Estate Video Blog with Frank Del Rio Orange County, CA Real Estate Video Blog with Frank Del Rio: Inventory and Home Sales: What's the Relationship? Inventory and Home Sales: What's the Relationship? Our market has been changing a lot lately. One area where we have seen a lot of change is in inventory. In the video, we created a bar graph that illustrates the point. This graph shows both our available inventory and our sold homes over the last 9 years. We collected the data from the past 9 years specifically because 9 years ago is when the market shifted. The public didn't see this shift until 2006 and by that time it was too late. Back in August 2005, we had just under 1200 homes for sale and 600 homes sold. Fast forward to August 2014, where we have 1100 homes for sale and only 400 homes sold. It appears that history may be repeating itself. Back in 2005, this caused inventory to skyrocket and prices plummeted for the next 5 years. 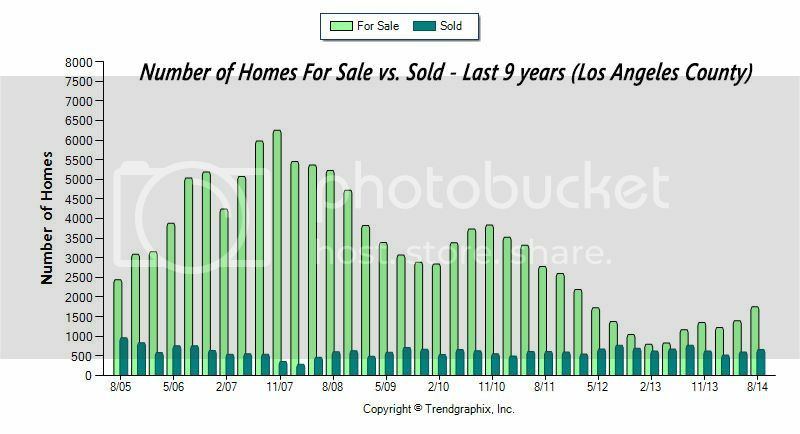 Such trends were not just exclusive to Orange County, as both San Bernadino and Los Angeles County experienced the same increase/decrease activity between inventory and homes sold. So what does this mean for home buyers and sellers? Well, it's basic economics. The lower the supply, or in this case, properties, the higher the demand for it. As a result, people pay a higher price. The higher the supply is, the less the demand to buy it. More importantly, this results in a much lower price. 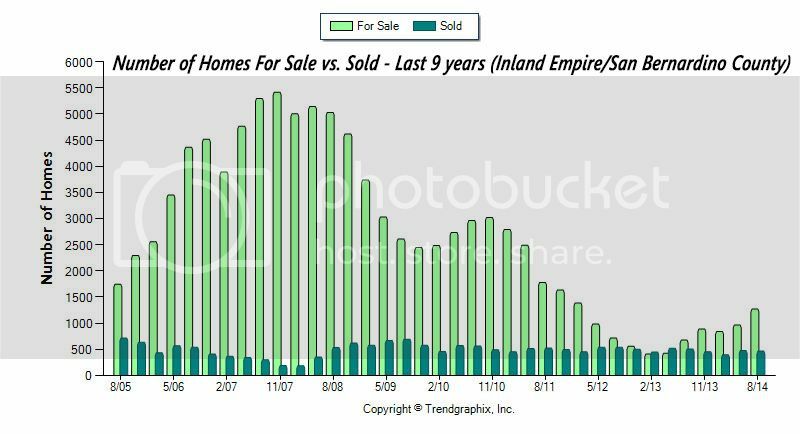 This increase in inventory and subsequent slow in sales is one of the many factors that are resulting in market change. Real estate is hyper-local. Each area is a little different. If you want to see what is actually happening in your specific town or neighborhood, send us an email with the name of the area to fdelrio@live.com. Our intention is to provide you with the most accurate information possible so you can make the best decision for you and your family. If you have thoughts about refinancing and are therefore waiting for more equity, now actually may be a good time to start before prices slide back further. If you are thinking of making a move in the next 3-4 months, you may want to take a closer look at your situation to see if it makes sense to start now before prices come down even further. You probably know someone who has owned a home from 2006-2012 and wished they would have sold in 2005 before the prices went down and they lost all their equity. We don't want this to happen to you or anybody you know this time around, so do us a favor. Forward this video to someone you think it will help. Of course, if you need to speak with me about your situation, give us a call and we can discuss a good game plan for you.